Deutschmann now also offers the UNIGATE IC bus node with a POWERLINK interface. With the pre-certified embedded module, device manufacturers can reduce the time it takes to implement the Industrial Ethernet protocol by as much as 80%. The UNIGATE IC POWERLINK module comes ready to operate and thus optimizes the development costs and the time-to-market of the device. No changes to the firmware are required. 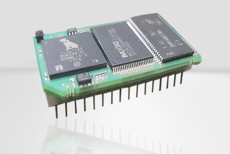 The module has two POWERLINK interfaces, a microcontroller as well as flash memory and RAM. It can be connected to the microcontroller of the terminal device via a UART interface or operated as a standalone device. The powerful module can be programmed using an intelligent script language developed by Deutschmann. This makes it possible to implement complex applications that cannot be represented through configuration alone. The script is created using the Protocol Developer Tool, which is specially optimized for bus communication. The UNIGATE IC bus node is now also available with a POWERLINK interface.